The world loses a staggering one-quarter to one-third of all food produced for human consumption, according to the World Bank’s quarterly Food Price Watch report, with the developed world leading the wastage. The world is losing 25 to 33 percent of the food it produces – nearly 4 billion metric tons – according to estimates from the World Bank, the Food and Agriculture Association (FAO) and the World Resources Institute. In regions suffering from malnourished, such as Africa and South East Asia, this translates as 400 to 500 calories per person per day and in the developed world up to 1,520 calories. Cereals were highlighted as representing more than half food lost or wasted at 53 percent by calorie content, but by weight fruits and vegetables represent the largest share of global food loss at 44 percent. Most of the wastage takes place at the consumption stage (35 percent), followed by production and handling and storage (both 24 percent). “The amount of food wasted and lost globally is shameful,” Jim Yong Kim, the president of the World Bank, said in a statement. 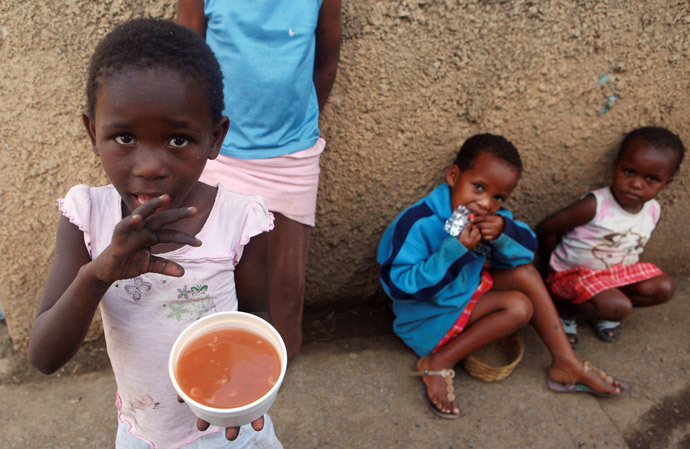 “Millions of people around the world go to bed hungry every night, and yet millions of tons of food end up in trash cans or spoiled on the way to market. We have to tackle this problem in every country in order to improve food security and to end poverty,” Kim added. The report also found a substantial difference between the amount of food lost in developed and developing countries and across regions. 56 percent of food loss takes place in the developed world and only 44 percent in developing countries. In North America, some 61 percent of food losses are in the consumption stage, for example food, which has been bought and then rots in refrigerators. In the US and the UK and average family of four wastes between $1,600 and $1,100 a year in food they buy but do not consume. The authors blamed the policies of large supermarkets, which encourage overbuying by consumers as well as overproduction of some foods for sale. In contrast, sub Saharan Africa lost just 5 percent of food at the consumption stage but vast amounts were lost during production and processing. For example, the large amounts of water used to irrigate rice or roast coffee were deemed wasteful, especially if the end product is lost before it reaches the consumer. The study found that there were large variations across countries. Although in the short-term, pressures in food prices are expected to weaken, weather conditions in Argentina, Australia and China, as well as higher oil prices, mean that food production will need constant monitoring. The World Bank also set out how it intends to boost agriculture and agriculture-related investment; commitments in 2013 amounted to $8.1 billion. Potential solutions to limit the amount of food wasted include changing agricultural production techniques and making suitable investments in transport and storage infrastructure as well as changing commercial and consumer behaviour in developed countries. Posted on February 27, 2014 by Ace Worldwide News Group	• This entry was posted in #AceFoodNews and tagged #AceFoodNews, Africa, Argentina, Asia, China, Food and Agriculture Organization, Jim Yong Kim, Sub-Saharan Africa, United States, World Bank, World Resources Institute. Bookmark the permalink.